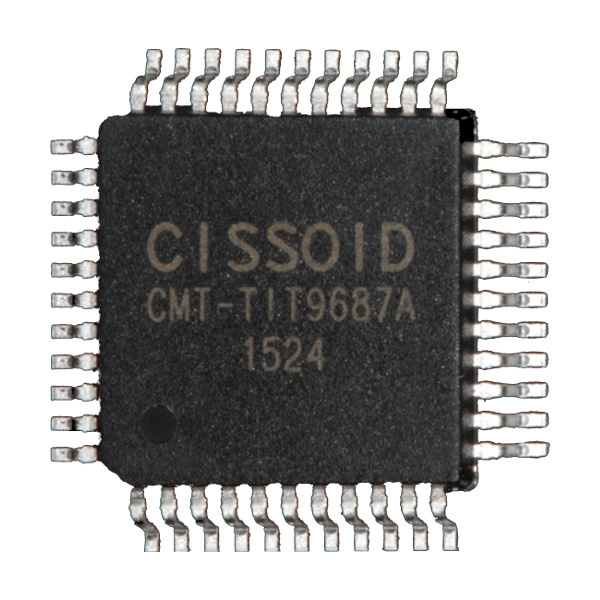 CMT-HADES2P is a high-temperature, high reliability single chip primary side of a gate driver solution. It implements a current mode controlled DC-DC flyback converter for the generation of the on-board power supplies and the isolated data transmission from the external control interface to the 2 secondary sides and performs local fault management. This device has been designed in a way to reduce as much as possible the required number of external passive devices and to limit the requirement in high capacitor values (large footprint at high temperature). Its features a UVLO monitoring on the incoming power supply, a linear voltage regulator to generate the local 5V supply voltage and an on/off keying modulation of the data signal towards the secondary side. It offers wide voltage range for the input PWM signals (5 to 15V) and hysteresis to enhance immunity to system noise; it also features a spike filtering function on those PWM signals to prevent spurious turn-on/turn-off of the secondary gate drivers. Typ. 180 kHz switching freq. Ideally suited for high reliability markets like automotive, aerospace, railway, Oil & Gas. An evaluation kit EVK-HADES1210 implementing a high-temperature isolated gate driver based on CHT-HADES2P and CHT-HADES2S is available at Cissoid.